You can use Labor Types to help define the type of labor hours (such as Overtime, Double Time, Comp Time, etc.) that your staff will track in Work Order. Click on Labor Types under the Manage Codes section. Enter the name of the labor type under Activity Description. 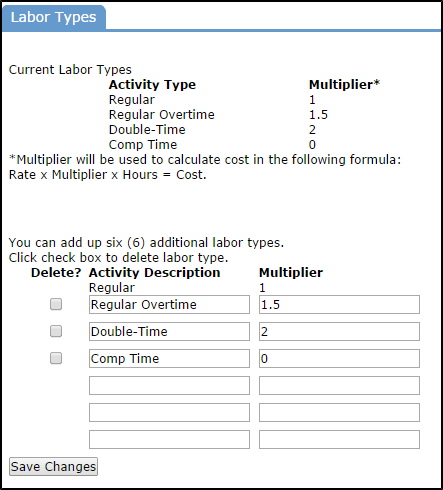 Enter the Multiplier that will be used to calculate the cost of that particular labor type. For example, enter 1.5 if your overtime rate is time and a half of the base pay. Click Save Changes. You can add up to six additional labor types.